Eastern OptX has introduced a 5G Radio Test Set which replicates the propagation path for real-world applications. The Eastern OptX 2400+ allows the user to test a variety of Air Interfaces using the same system without modification, and at the same time. As the telecom industry continues to develop specifications for the upcoming 5G rollout - one thing is clear - millimeter wave (20 to 40 GHz and beyond) will play a major role in 5G. The advantages to millimeter wave technology - bandwidth and latency - far outweigh the only identified disadvantage - propagation loss. Currently, 5G prototypes are being verified via air interfaces at different distances. Due to day-to-day changes in weather, these tests are extremely unreliable because impairments such as weather cannot be repeated. To address this challenge, and deal with propagation loss, the Eastern OptX developed the 2400+ 5G Radio Test Set to provide repeatable range simulations at various distances in the laboratory. This system works from 20 to 40 GHz with a selectable range from zero to one mile in five-foot steps. Attenuation is set on each distance based nature's own "range formula". These propagation simulators have the ability to add environmental conditions such as rain, temperature variations, multipath, and other competing interfering signals. Additional systems are available from Eastern OptX that can provide up to 50 miles of range with 5-foot resolution, although 5G will probably only require a one mile maximum at a few feet of resolution. The Eastern OptX 2400+ is not a signal emulator. The systems use low-loss fiber optic cable to create the propagation delay associated with radio transmissions from 20 to 40 GHz. Two radios may be connected to the system allowing full duplex operation. Each radio may operates over identical Air Interface with uni or bi-directional multipath. The delays between radios may be varied from 0 to 1 mile in 5 foot steps with propagation loss control. The 2040+ creates a variable test range right in your lab. It can be used as a design aid and as a test tool for new modulation and encryption schemesprior to expensive and time consuming field testing. 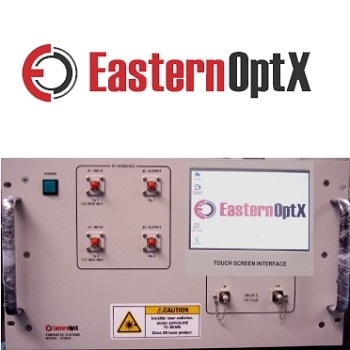 Eastern OptX has been supplying Propagation Simulators for radar and wireless applications for over 15 years. They now provide a system that replicates the air interface that the millimeter wave radio will see in the real world. The 2040+ is available today with 90-day delivery. For more information, click here.